Family owned, serving the Five Boroughs and Long Island for over 10 years. Superior Plumbing, Heating, and Mechanical LLC is a fully insured member of the Plumbers Local Union #1 and the Association of Contracting Plumbers. Our courteous and skilled work staff provides 24 hour emergency service in all 5 boroughs and Long Island. With over 30 years of experience in all phases of plumbing, heating, fire suppression, and state certified backflow testing, Superior Plumbing, Heating, and Mechanical LLC has the tools and the talent to work efficiently and effectively. 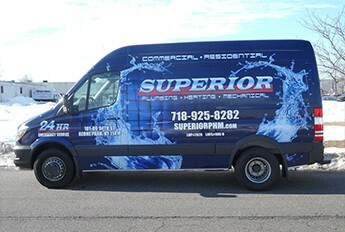 Superior Plumbing, Heating, and Mechanical employs NYC Licensed Master Plumber #2020 and NYC Licensed Master Fire Suppression Contractor #906-B.